At 4:30am local time (Pacific) I found myself staring blearily at the live feed LCROSS feed, as the Centaur and the LCROSS sheparding spacecraft plummeted toward the lunar South Pole. I wasn't alone, judging by the fact that #LCROSS was the #1 trending topic on Twitter at that time, and updates mentioning the mission were coming in at well over 100 tweets per minute. I was also watching the SLOOH live feed, which had 4200+ viewers around impact time. 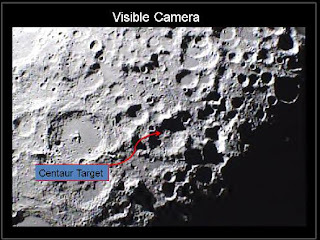 The 2-ton Centaur slammed into the Cabeus crater as planned, as the LCROSS sheparding spacecraft, armed with a multitude of instruments, confirmed a newly-created hole in the ground in the infrared. But something surprising happened for the viewers watching the impact: we didn't see anything. While disappointing to viewers, this is still an interesting outcome. The NASA LCROSS team itself, full of scientists, engineers, and researchers, certainly seemed sure of the fact that the impact would create such a large plume of ejected lunar material that even amateur observers, equipped with nothing more than a 30-in telescope, would be able to witness. As one astronomer from the UK questioned on his observatory blog, "How can 2.5 tons of spacecraft impact a 600ft crater and NOT show any ejecta or plume?" Some LCROSS scientists, however, were not surprised by the lack of plume. In an article from Science last spring, LCROSS principal investigator Anthony Colaprete was quoted as saying, "It's a very unproven and highly unpredictable science, impact cratering." Impact modeler Erik Asphaug agreed, calling LCROSS "the most challenging impact modeling I've ever done." It seems possible that the compressibility of the regolith, or the possibility of the plume hitting the crater rim, or a number of other factors may have impeded the ability to observe the plume. At the very least, this mission emphasizes that we still have much to learn about the Moon. The LCROSS sheparding spacecraft collected a good amount of data from the Centaur impact, and we will eagerly await the results from those instruments. This analysis may take some time, but for now we'd like to say "Congratulations!" to the entire LCROSS team for a successful mission, and we look forward to finding out if you hit the gold mine!